If I had to choose one thing that has made a huge difference in my life and the life of my senior dog, I would have to say it’s a pet stroller. Although we would never have left Red behind on a day trip (unless we had a pet sitter), having the dog stroller made it a lot easier to include her. I highly recommend every senior dog parent purchase one, but it turns out our stroller had another use I never could have foreseen. Almost 2 years ago my dog Jack became paralysed quite suddenly, meaning within the span of just a few hours. During his recovery he was only allowed 5 minute walks, but I also wanted to make sure he wouldn’t get bored or start feeling depressed. With the permission of the neurologist I took Jack out every day in the stroller, making sure we stopped in to see some of his favourite humans along the way. He’s now fully recovered, but when he’s running around on a hot day he’ll often take a break by lying underneath it in the shade it creates. He has also been known to hitch a ride part of the way home until he gets his second wind! You may have already started looking for a pet stroller and become somewhat overwhelmed by the number of styles and options available, or you have yet to start because you haven’t a clue where to begin. Either way I’ve got you covered. 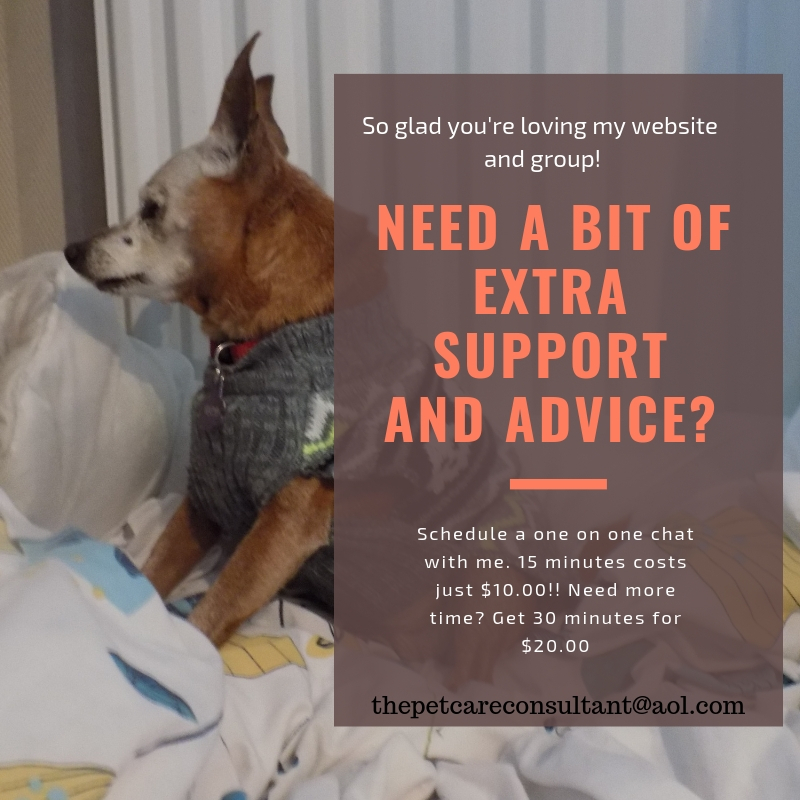 I’m going to be discussing the various features you’ll find in a pet stroller as well as things to be aware of, to help you choose the best one for your senior dog. The more features it has, the more beneficial it will be. Do follow weight guidelines, as the frame has to be able to offer enough support. If your dog is at the recommended weight or even just below it, I would play it safe and buy a bigger size. Weight and size are 2 different things. While the stroller may accommodate your dog’s weight, not all dogs who weigh the same have the same measurements!! I suggest measuring from his nose to his tail, and his width, then check the interior dimensions of the stroller. Nothing wrong with having a nice looking stroller if that’s important to you, so it’s good to know there are various colours and prints to choose from. 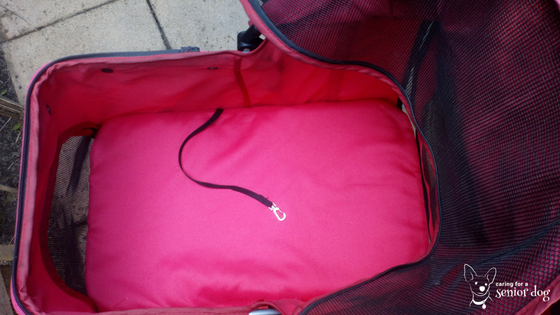 You will absolutely want your dog stroller to fold for ease of storage and ease of use. Most need two hands to fold it, some just one. Be sure the stroller you choose is sturdy and can accommodate the size of your dog. The last thing you want is to be miles from home with a broken axle or a cracked wheel, and a 40lb dog you couldn’t possibly carry. Is the handle height comfortable? If not is it adjustable? Some have the option, others do not. 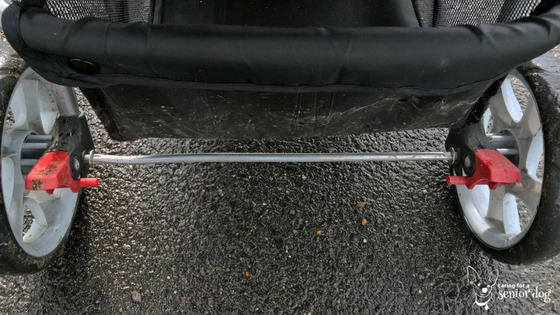 Placement refers to how far the handle sticks out, and if it’s far enough so you don’t kick the back wheels when walking, especially at a faster pace. Pushing an 8lb dog on a paved path is one thing, but what about an 85lb dog over rough terrain? Too much hard work, and no one will benefit. How easy will it be to jog or do off road walking with a dog inside? A lot of that will be down to the weight of the stroller itself and the type of tires. Sometimes a stroller is just a stroller, but other times it can also be a bike trailer, car seat or even a pet carrier. A canopy is an important feature that will protect your dog from the sun, rain, even bugs. Having one that folds means options – keep it open so your pup can enjoy the beautiful weather and have a great view, but when it becomes too hot, it offers shade while still allowing him to see. I love this feature and it’s one my pet stroller has. There is an area on the canopy that is mesh with a Velcro flap, which not only provides an extra source of ventilation when the canopy is closed, it also means I can check on my dog easily without stopping. 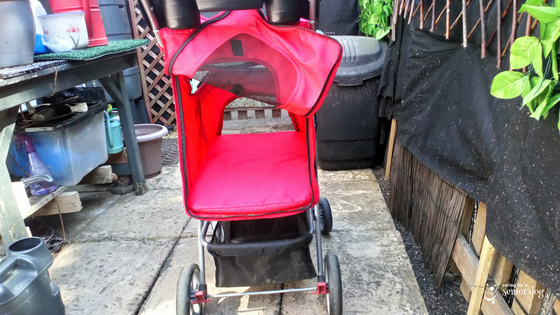 No need to open the entire canopy, or walk around to the front of the stroller. More mesh means more breathability, and a better view for your dog if he’s too small to see out the top or if he’s lying down. Pay attention to the sturdiness of the mesh, too thin and he can claw it and tear it. I would say most strollers have the option of completely enclosing it, and I like that for a couple of reasons. One being added protection from the weather, the other for safety to prevent him from jumping or trying to jump out. 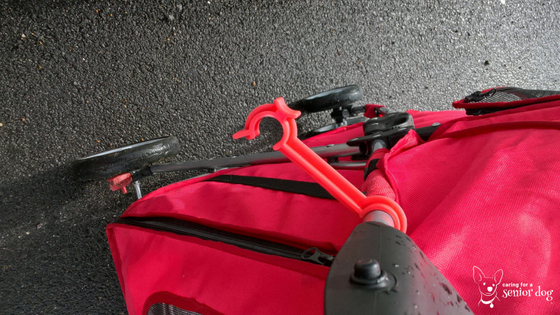 When open the canopy attaches to the stroller with a zipper or non-zip option. 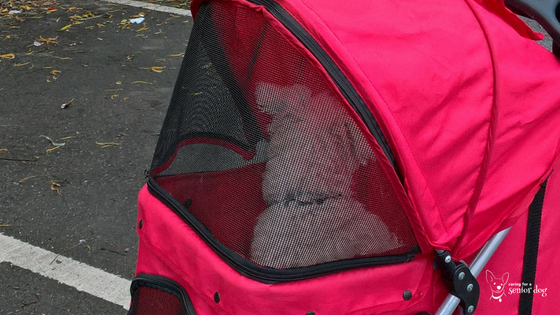 Some strollers have one way to put your dog in and that’s through the top, others also have a rear zippered entry. This is particularly handy if you have a bigger dog, or you are unable to lift him. If it’s low enough to the ground your senior dog may be able to walk right in, but if he can’t a small step will help. 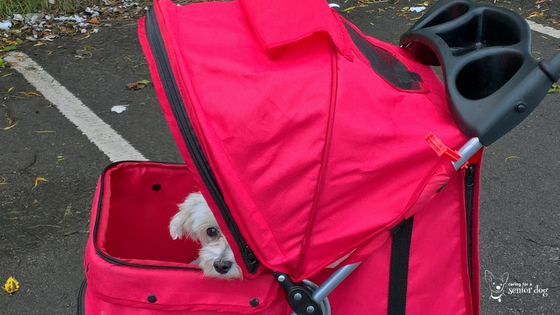 A leash attached to the stroller, it’s a great safety feature should your dog get anxious and try and jump out, or so excited he can’t wait to get out. Depending on who is in the stroller I may keep hold of the leash, but I also use this clip as an extra safety measure. Not all tires are suitable for all terrains, plastic being perfectly fine for smooth pavement, while air filled better for rougher and uneven surfaces. Fixed wheels or swivel? 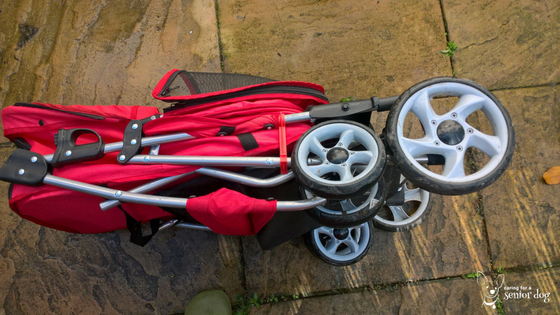 My stroller has swivel wheels which is fine for pavement, malls and other smooth surfaces, and good for turning corners and manoeuvrability. Fixed wheels are best for jogging and off road. 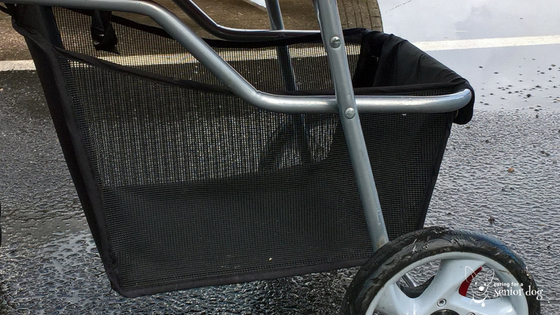 Many strollers have wheels you can let swivel or fix into place. 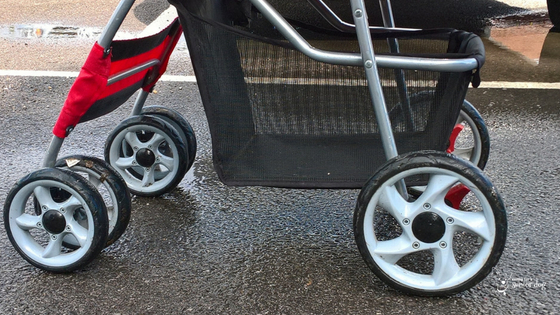 An excellent safety feature to stop a stroller from rolling, you simply engage and disengage with your foot. Perfect for public transport, stopping for a chat, parking the stroller while walking the dog, or even while loading and unloading your pet. 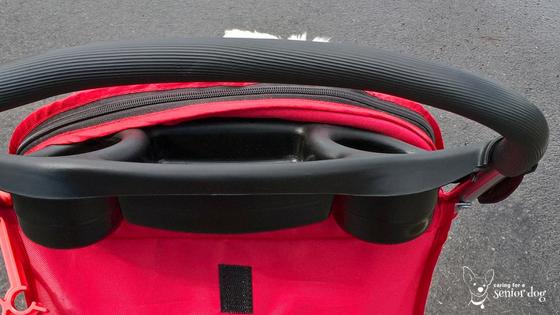 For me a storage basket underneath the stroller is a must have, so check the size before you buy. On day trips we do take a knapsack, but having the basket means quicker access for things like – an extra sweater, human and canine water and snacks, sun hat, sun tan lotion…. Most strollers have it, although configurations may differ. It’s super convenient for items you want to keep close to hand such as water bottles, keys, phone, treats… If you like to keep a water bottle within easy reach, check the depth of the holder. Mine is perfect for a small bottle of about 8oz (250ml) or so, anything bigger and it will fall out if we walk on rougher terrain. It’s not a huge deal although slightly inconvenient. I put it in the canopy when it’s closed but when it’s open I have to put it in the storage basket. Trust me when I tell you it’s a much needed feature. This latch is affixed to one part of the frame, and once it’s folded you click it onto the other part and it keeps the stroller closed. Unfortunately ours was lost (I don’t want to blame anyone, but it wasn’t me!! ), and believe me it’s a nightmare without it. I should really try and find a replacement. Some pet strollers come with it, most don’t, mine didn’t. The good news is they can be purchased separately because they are handy to have should you get caught in a rainstorm. 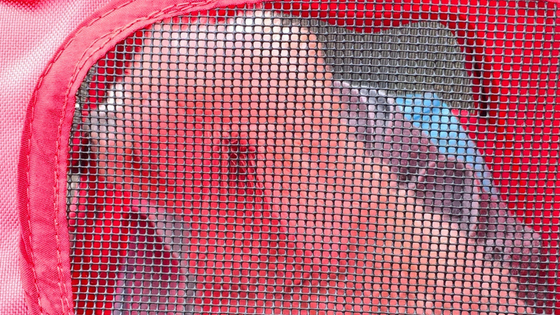 Even if the stroller fabric is water resistant, if the rain is heavy enough it will get in through the mesh windows. 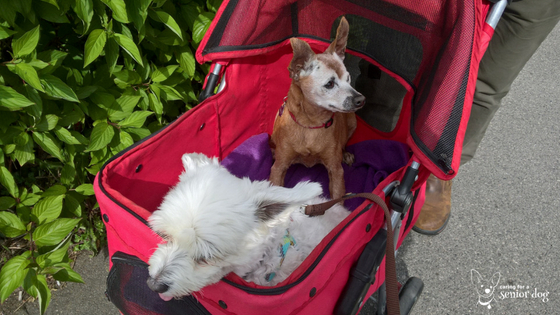 If you have a senior dog who isn’t able to walk too far or join you on day trips, then you definitely need a pet stroller. It can be as basic or fancy as you like, and they come in a wide variety of prices to suit most budgets. Now that you see how wonderful they are, you don’t have to leave your old dog at home, or stay home because you don’t want to leave him alone. It can absolutely be a life changer…for both of you! I never thought about all the different points to consider when choosing a stroller. No two are alike, that’s for sure. I’m hoping when I move to the suburbs I can get my cats used to a stroller. I know there are many who use a pet stroller for their cats, but mine never would have been able to use it they would have bolted!! Hopefully yours will be more amenable. It’s incredible how much of a help it was for Red and even Jack who used it while recovering from spinal surgery. First off I am so happy Jack made a great recovery! Lyla is getting old and has always had mobility issues so I am glad you have this article for my reference. I will bookmark it so I can easily find it when the time comes we need a stroller for her. Thanks Joely, some people to this day, 2 years after the fact, are so amazed at how well he’s doing. Hopefully a pet stroller will help Lyla when you feel she’s ready. I love that they can join in where in the past they might have been left at home. Great list of features. I’m in the market for one for my cats. Thanks Holly, hope your cats settle into a pet stroller. I never could have gotten any of mine to stay put in one!! Pet strollers are marvelous, I can’t say enough good things about them. What great info! There’s so much more to consider when choosing a stroller than I ever thought about. Thanks Julia. To be honest when I bought my stroller I based it on price and new nothing about it. As I started using it more and more, I realised all the various features and how important they were. 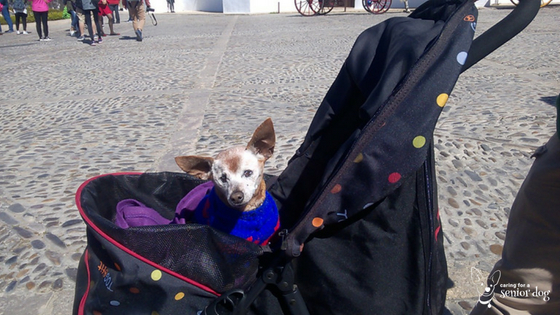 Pet strollers can really help make a dog’s life more enjoyable! My sister has one for her Pomeranian and it lets them go a lot of different places. Wheel size is really important if you are going to be on different terrains. They helped my dogs so much, it made a huge difference for all of us. There were many times we were able to bring my older dog along on day trips, whereas before we either wouldn’t have gone without her, or had to hire a pet sitter to keep her company. SOO many considerations when choosing a pet stroller… much like picking a baby stroller, which I just did and WOW that was hard. Thanks for sharing these tips. I know a lot of us will inevitably need a stroller for our pups someday. There are a lot of considerations, I had no idea when I first bought a stroller. The number of features is amazing, almost like a baby stroller. Couldn’t have put it better Robin. They all deserve to get out, and even if a senior dog or cat is having trouble, no reason they have to get left behind. 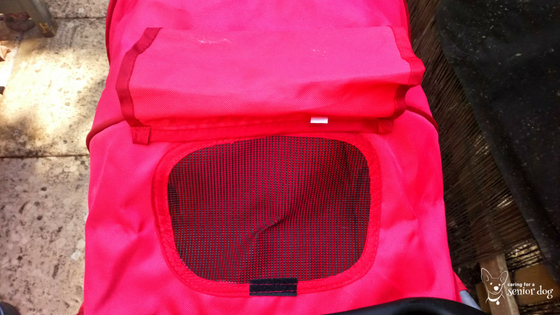 I bought a pet stroller for the BlogPaws conference and I didn’t think I would use it much. Well, Buffy now loves her stroller! I got a low-end model since Buffy weighs about 30 pounds and after she dies, I’ll probably get a springer spaniel, so it would be too small. Thanks for telling me what the red clip is for! I thought it was to hook on a leash! I used many of the same thoughts when I bought her stroller. But what I really need is a collapsible wagon, which would accommodate a larger dog, plus be close enough to the ground to not be top heavy and possibly tip over. I know what you mean Sandy. 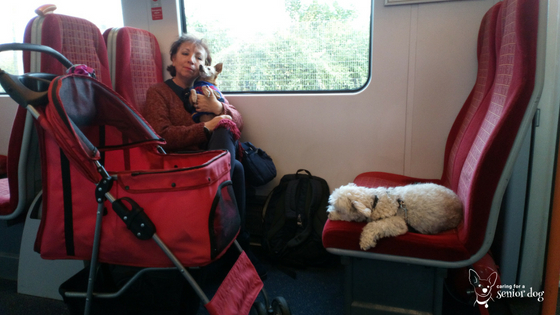 You don’t think you’re really going to use a pet stroller….until you have one. Once I got mine I wondered how I lived without one, and thought how many back aches I could have prevented!! I bought a fairly basic model as well and it has served me very well. I’ve seen collapsible wagons online. Remember, alot of strollers have rear entry and with the help of a step your next dog may be able to walk right in. A wagon may be better suited for a larger dog though. Last summer at one of the outdoor dog-friendly malls, I saw several people walking with dog strollers. Usually, it was retired people with their senior dogs. The people would let their dogs in and out of the stroller to smell or explore in certain areas. They could easily get into the elevator if they wanted to shop on the second level instead of walking around the parking lot. And they were always friendly. They liked meeting Bernie and would spend a few minutes chatting. I love that you’re breaking down everything a pet parent would need to consider if they were looking into a stroller purchase. Incredibly helpful information here that I will tuck away for future recommendations! How fun that must have been for you and Bernie. Something about seeing a dog in a stroller gets people talking. A few months ago we were at the holistic vet who lives in a lovely little town about a half hour from us. We had Jack and of course Red in her stroller, and the amount of attention we got was unbelievable. We could barely take two steps before someone else stopped us to have a chat. My husband always loved pushing the stroller because he saw it as a public service announcement. He wanted to educate people about senior dogs, and ways to make sure they didn’t always get left behind. Pet parenthood has come a long way when we can now include our fur babies in everything we do. Great post educating us how to select a stroller once we need one. That’s very true. With the popularity of the stroller, and more and more people learning about its benefits, it’s so much easier to include everyone in family outings. Thank you for sharing this incredibly important information. 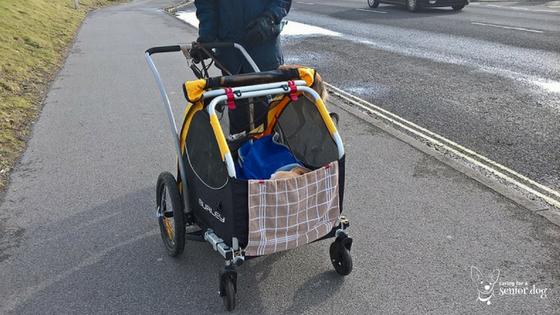 So many Corgis end up needing strollers due to back issues later in life, and I am so thankful that people like yourself share their experiences with different strollers and variables. Corgis are particularly long, so measurements will be key! 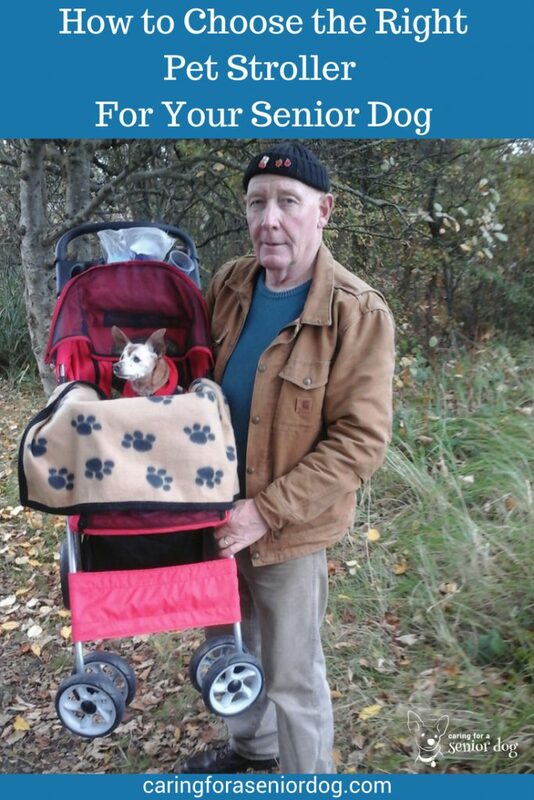 I’d be lost without a pet stroller. It’s true I imagine it could be challenging to find a stroller long enough. If that’s the case a wagon may be a better solution, even one that’s homemade so it can be built to your dog’s measurements.